bl.uk > Online Gallery Home	> Online exhibitions	> Asia, Pacific and Africa Collections	> Bund, Miralum Tank, 1902-03. 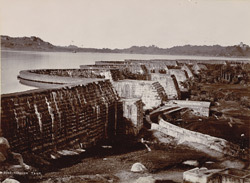 Photograph of the Bund, Mir Alam Tank, Hyderabad, from the Macnabb Collection (Col James Henry Erskine Reid): Album of Indian views taken in c.1902-03. The Mir Alam Tank was built by French engineers and named after Mir Alam, the prime minister from 1804-1808. It shows impressive engineering with 21 arches holding over 20.7 square km (8 square miles) of water.